Cream can be whipped in advance for use hours later. Simply whip it until stiff, then spoon it into a sieve lined with a double layer of cheese-cloth. Set over a bowl with the bottom of the sieve 2 inches above the bottom of the bowl. Cover tightly and refrigerate for up to 48 hours. If, when you get ready to use the cream, it’s a little too stiff, whisk in 1 to 2 tablespoons liquid cream. 1) Use a (chilled) stainless steel or copper bowl for whipping cream. 2) Place a clean bowl and beaters in the freezer for 15 minutes before whipping cream. 3) One way of making great whipped cream frosting for cakes is: Add 1 to 2 tablespoons of instant dry vanillla pudding mix as you are beating the cream. The pudding adds flavor and texture to the cream. 4) Beat heavy cream with some confectioners' sugar (icing sugar). Use 2 tablespoons of confectioners' sugar per cup of heavy whipping cream or double cream) to help stabilize the whipped cream. 5) Beat in 1/4 teaspoon unflavored gelatin per cup of whipping cream, heavy cream, or double cream to help stabilize it. Gelatin gives whipping cream a firm, mousse-like texture giving it many uses. Because gelatin stabilizes the whipped cream, it does not weep (bleed water after awhile). 6) Add a teaspoon of cream of tartar to chilled heavy cream, whipping cream, or double cream to help it whip well. 7) Add a few drops of lemon juice to whipping cream to help stabilize the whipped cream. 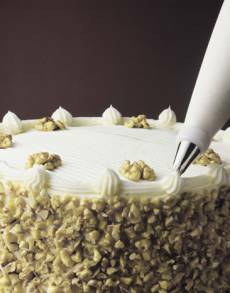 8) Use of Piping Gel for Stabilizing Whipped Cream: Whether you want to use whipped cream to ice or as a filling, stabilizing it with piping gel can be so helpful. Add 2 tablespoons of piping gel to 1 cup liquid heavy whipping cream or double cream, and 1/4 cup confectioner’s sugar. Whip with chilled electric beaters until stiff peaks form. You can use the stabilized whipped cream to make rosettes, shell trim, star trim and other border designs. Combine whipping cream and sugar in mixing bowl. Whip to soft peak stage. Add piping gel and vanilla, then continue to whip stiff peaks. Do not overbeat. Sprinkle the gelatin over the cold water in a small saucepan and let set for about 5 minutes. Heat on low until the gelatin has become clear/dissolved - DO NOT BOIL. Add the syrup and heat thoroughly. Cool and store, refrigerated, for up to 2 months. TO USE: Put in icing bag or plastic squeeze bottle and decorate. As an alternative, you can use Frozen Non-Dairy Whipped Topping (such as CoolWhip, or Packaged Topping Mix, such as Dream whip). Thaw frozen whipped topping in refrigerator before coloring or using for decorating. Use packaged topping mix immediately after preparing. Do not allow either to stay at room temperature, as it becomes too soft for decorating. Store decorated cake in refrigerator until ready to serve. In a small bowl, combine 1/2 cup (1 stick) softened butter and 2 tablespoons orange marmalade. Beat with fork or electric mixer until blended. Serve with warm scones, biscuits or muffins. In a small bowl, combine 2 tablespoons butter, 3 tablespoons flour, 2 tablespoons sugar, and 2 tablespoons finely chopped almonds or walnuts. Blend with a fork until crumbly. Sprinkle on top of plain scones or muffins before baking and lightly press into the dough. Pour 2 cups of pasteurized (not ultra-pasteurized) heavy cream into a shallow glass pan or pie plate. Cover with foil, then place in an oven at low temperature (our oven has a "warm" setting, which would work) for 8 hours or overnight. Do not stir. Carefully remove pan from oven, being careful not to shake it. With a slotted spatula, skim the thick cream from the surface, leaving the watery residue behind (add it to bread dough or soup). Gently stir the clotted cream to smooth it, and store in the refrigerator. Tastes best served at room temperature. To make creme fraiche, combine 1 cup whipping cream and 2 tablespoons buttermilk in a glass container. Cover and let stand at room temperature (about 70 degrees F) from 8 to 24 hours, oruntil very thick. Stir well before covering and refrigerate up to 10 days. Serve with warm scones. Place the juice and grated rind of 3 lemons in a heavy saucepan or the top of a double boiler. Add 1 stick of butter and 1 cup sugar. Over low heat or simmering water, stir until the butter melts and the sugar dissolves. Beat 2 large eggs in a separate bowl and add slowly to the lemon mixture, stirring constantly with a wooden spoon. Cook until the curd thickens and coats the spoon. Pour into sterilized jars, cover, and store in the refrigerator. Serve with warm scones. Spread strawberry, apricot, or any flavor fruit preserves or jams of your choice over warm scones, and top with Devon or Clotted cream. Creams vary according to the amount of butterfat they have. Lightest of all is Half & Half, which is half milk, half cream and weighs in with a butterfat content between 10.5 - 18%. It CANNOT be whipped, but it's nice with coffee, or on cereal. Or coffee cream or table cream is richer at 18 - 30% fat, but it still CANNOT be whipped. Light Whipping Cream or Whipping Cream(with a butterfat content of 30 - 36%) and Heavy Cream or Heavy whipping cream (with at least 36% fat) ARE heavy enough to whip, and aren't as prone as lower-fat creams to curdling in sauces. The higher the butterfat content, the less beating is required to get whipped cream. Europeans go for even heavier creams, like Double Cream (with a butterfat content from 42% to 48%), Extra-Thick Double Cream, and Clotted Cream or Devonshire Cream, which is often spread like butter over scones. Look for Clotted Cream in large supermarkets, but (perhaps luckily) the Double Creams are very hard to find. You can buy Ultra-Pasteurized versions of these creams, but they tend to have a burnt milk taste and don't whip as well. This matured, thickened cream has a slightly tangy, nutty flavor and velvety rich texture. The thickness of crème fraîche can range from that of commercial sour cream to almost as solid as room-temperature margarine. In France, where crème fraîche is a specialty, the cream is unpasteurized and therefore contains the bacteria necessary to thicken it naturally. In America, where all commercial cream is pasteurized, the fermenting agents necessary for crème fraîche can be obtained by adding buttermilk or sour cream. A very expensive American facsimile of crème fraîche is sold in some gourmet markets. The expense seems frivolous, however, when it's so easy to make an equally delicious version at home. Double cream is the name in Britain for a very rich cream — containing 48% butterfat. Whipping cream in this country, by contrast, contains between 30% and 40% butterfat. Single cream in Britain is comparable to American half and half (and may also be called pouring cream), with between 10% and 12% fat. Double cream is so rich, in fact, that it is easy to overwhip it and get it too thick. Some cooks add a tablespoon or so of milk to 8 to 10 ounces of double cream before whipping it to keep it loose enough. This specialty of Devonshire, England (which is why it's also known as Devonshire or Devon cream) is made by gently heating rich, unpasteurized milk until a semisolid layer of cream forms on the surface. After cooling, the thickened cream is removed. Clotted Cream can be spread on bread or spooned atop fresh fruit or desserts. The traditional English "cream tea" consists of clotted cream and jam served with scones and tea. Clotted cream can be refrigerated, tightly covered, for up to 4 days.